Less than three weeks to go - Eeeeek!!!!!!! It doesn't seem five minutes ago since I took the hasty decision to sign up for the WSPA Charity Trek through the Carpathian Mountains in Romania. In lots of ways my brain acts like a two-year old - if I can't see it it's not there - if it's not happening today it can be worried about tomorrow - etc. I blame it on being left-handed and right-brained - or something like that. I believe it also makes me very untidy. Therefore, when I signed up it was so far away that I didn't really think too much about actually going on the trip! However, I have learnt quite a lot since signing up. I now know that as a blogger I am about as good as a chocolate teapot. So much for blogging every week. I'm not quite sure why I have been so useless, perhaps because I don't know who, if anyone will read my ramblings. I have also learnt that I really do have the best husband in the world. He has made my trip possible, has walked his socks off with me training, and has put up with me doing far less cooking and cleaning than I would normally do. (And I don't normally do vast amounts!) Even when we went on holiday earlier this year he was happy to spend most of the ten days we had in Spain walking up hills! Most importantly, when my spirits have been low and doubts about the whole adventure have crept in he has given me unlimited reassuring hugs - thank you Chris - you are a star! Another thing that I have learnt is that I now have complete admiration for anyone who does any fund-raising. I had thought that the walking would be the hardest part and that the fund-raising would be relatively easy. Not so, we are living in difficult times and I have really hated asking people for money. Having said that, I have had a brilliant response and now, having raised over £2000 I am not too far from my target. I really am very grateful for everyone that has helped me to get this far. 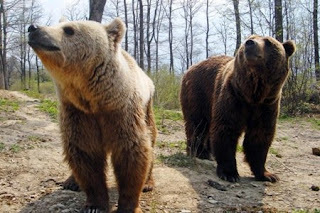 Every donation no matter how much for is really appreciated by me and will help to save these poor bears. 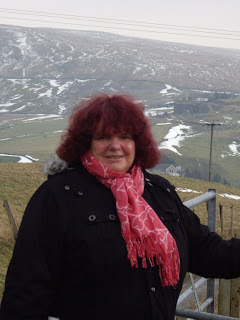 I already knew that I lived in a very special place, but since I have been fund-raising and training it has made me realise just how brilliant Todmorden is. Lynn and Glyn from our local pub, The Masons Arms have been amazing, they have collected sponsors for me and have had collecting tins as well. The regulars have been incredibly generous and lots of the Pub Quiz Teams have given over their prize to me. Local business have been generous with their donations and complete strangers responded to an article in the local paper. Also, walking various routes in the hills above the town I have seen some breath-taking scenery. The people of Todmorden are very friendly and age is no barrier. 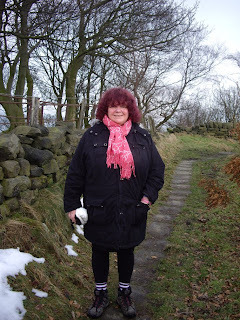 I have recently been on some long walks with a lovely woman who is less than half my age and we have had some brilliant times. At times we have had to stop and pause for breath because we are laughing so much. Thank you Kylie - you are brilliant. Yet another friend organised an event at work to raise money for me. I make teddy bears for a living and the bear world has also been very kind to me in terms of fund-raising. I was particularly touched that one Artist, Lynne Bowie, Madabout Bears, auctioned a beautiful bear with all proceeds going to WSPA. Other Artists and Fair Organisers have been very generous as well. I thank you all and apologies for not updating my website to include everyone - it will be done, it is on my list of jobs to do! I really do appreciate everyones help. So not long to go now. This morning I went to the Mountian Shop to buy bits and pieces for the trek. I was ridiculously excited to find both a pink rucksack and pink water bottles. Sadly, the trekking shorts are khaki coloured oh well! I thought that the walking would be the hardest part. I think I have now trained hard enough to say that the walking part should be achievable. I am now worried about the other aspects of the trip. I don't know anyone else who is going on it, and I don't know what the food or accomodation will be like. I am scared that no-one will talk to me and that I will be Dawnie No Mates. I also have a few scary thoughts about toilets or lack of them but I am trying not to think about that! It has been a bit of a whirlwind summer. My dear son and his girlfriend both finished Uni and moved in with me then he got a job and moved out again fairly quickly. In one week we had two graduations, one wedding, a 21st birthday and then it was our wedding anniversary as well. Phew! I had carefully written out a list of all the people I wanted to write and thank. It is here somewhere and when I come across it I will write and thank them. On Tuesday I shall be going to London to meet the team that are organising the trek and some of the other trekkers. I am looking forward to that, but I don't know whether it will make me worry less or more! The night before the trek I will be staying at Heathrow as the flight is early on Sunday. On the Friday night I am going to a local restaurant for a send-off dinner. Since starting training I have given up alcohol almost completely (would have been completely except for an unfortunate sambucca incident when Mark left Tod) I am looking forward to a few glasses of wine when I return. Or maybe I will just stick my head in a bucket of Baileys! When I first started out on this adventure it was my intention to Blog at least once a week. However the weeks seem to have a mind of their own and keep flying past before I can catch them. The trek is getting ever closer, and I am getting more and more excited and more and more terrified as the time goes on. Training is in full swing and my poor husband barely has time to set a foot inside the door at the end of the working day before I hand him his walking boots and drag him out again. It has been amazing watching the area come to life again after the long cold winter. 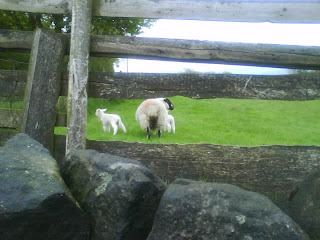 Buds are budding, blooms are blooming and sheep are lambing. The lambs have been gorgeous and I am really trying very hard not to think about the inevitable. I have to say that there are times when I wake up in the early hours of the morning and wonder what I have let myself in for. I worry about being the little fat one on the end of the trek that can't keep up. I worry that no-one will want to talk to me and I will be the one that no-one wants to walk with. Then I worry some more about getting the fund-raising side of things done. Then I think about the bears and spending time with them and it all comes together and I get really excited again. I really do feel like I am on a Roller Coaster and last weekend was no exception. There was an event in our town called Made in Tod - organised by the local Business Association it is an event that showcases local businesses and organisations. I was there with my Teddy Bears and raised quite a bit of sponsor money as well as another pledge for when I completed the trek. I was moved to tears by a sweet elderly lady who tapped me on the shoulder while I was walking round the exhibition and pressed a five pound note in my hand and said 'I think it is wonderful what you are doing for those poor bears'. Moments like that make me very determined to do well on the trek. It seems that I have a problem pronating (I can't remember if it is over or under) and that is causing all sorts of other things to go haywire. Anyway to cut a long story short I need bionic shoe thingys or something like that. Long gone are the days of glamorous purchases it's all sensible things now! So, tomorrow I have to go and see the Podiatrist to get fitted up. Then a few sessions of physio and I will be fit to walk. Anyway, no way will any of this deter me - I will finish that trek. Saturday night we went down to our local pub and I was overwhelmed by the reception I got there. The sponsor form that had gone down the week before was almost full, and loads of people came to talk to me about the trek. I also got lots of hugs. The Masons Arms in Todmorden really is the best pub in the world. Thank you so much to the regulars for all their support. Sunday and it was time to do some shopping. 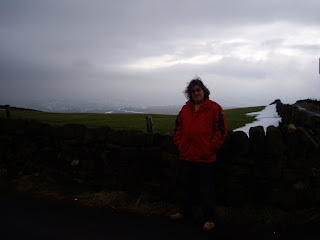 Now the evenings are getting lighter and longer we can venture further over the moors above our town. However, even in the dry weather it can be very boggy up there and if you are not careful it is easy to land thigh deep in mud. So, some trekking poles were to be bought. 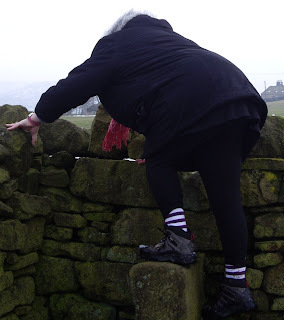 We immediately tried them out high above Hebden Bridge and have to say that they really did make walking down uneven paths a lot safer. Well time is running out, only about four weeks left until I need to hand over the majority of my fund-raising target. Now, off to get an early night - lots of training to do tomorrow. Time is Flying and Fund-Raising Needs Stepping Up! This is what it is all about - I really want to help rescue these captive bears. These bears are in the Sanctuary - They look so much happier. I really cannot believe that it is two months since my last post. After what has seemed a very long winter spring seems to have come very suddenly. Training has been steady over the last couple of months, but really took off when the clocks went forward last month. To be able to go for a walk most evenings is a real treat and we are happily spotting the new born lambs in the surrounding area. It is at times like this that I am really glad that I am a vegetarian! We have treated ourselves to a walking SATNAV thingy. A brilliant little device that tells us how fast we are walking, how far, and how high. It also tells us how long we have not moved for and it came as a little bit of a surprise to see that whilst we thought we had been for a three hour walk it was in fact just over two hours. I guess we do pause to look at the views quite a lot. I was amazed to see that our fastest speed was 47 miles per hour and that we had gone 30 miles. I then realised that I had forgotten to turn it off in the car! Oops. On the fund-raising side, this is going a bit more slowly than the training and I really need to step it up a gear. I really do hate asking people for money, but I am going to have to be a bit braver if I am going to reach my target. Although the trek is not until September, WSPA are wanting the majority of the money by June, so I guess that I need to get a shift on. We have booked a table at a Charities Market in Todmorden on 4th May - we will have sponsor sheets there as well as some games and some CDs, books etc., for sale. I have had some great donations and am very grateful for them. WSPA sent me some wonderful photos of the bears so I am putting those on here as I am sure they are much prettier than the sight of my bottom going over a style! This was in the hills this afternoon - how lovely to see the a blue sky and it was lovely not to have to wear a coat. It does not have to be a large donation, every penny is really gratefully received. Labels: A bear in captivity - this is what it is all about - I want to help to rescue him. Training started in earnest today. We thought that the snow had gone, but little did we know that it was still lurking up in the hills! A real boost this morning as the wii gave me a fit age of 21 - 32 years below my real age. Of course, I know that all that means is that I have mastered the balance challenges. Nonetheless a good start to the day. 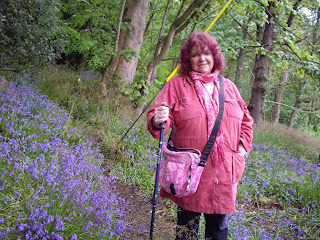 My gorgeous husband Chris is not doing the WSPA Trek with me. He is, however, my training partner and will be doing lots of strenuous walking with me. So, a two and a half hours walk into the hills around where we live. It was very pleasant but did make me wonder how I will survive a whole week of walking. I guess that's where the training will come in. The first lesson we learnt was that it will probably be wise to take a map with us - a very big circle brought us back to our original path about 500 yards away from where we had started. 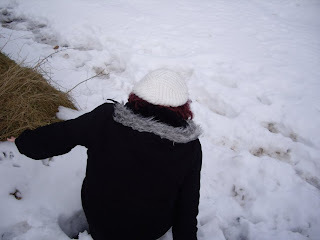 It was cold and the ground was very soggy from the melting snow but we eventually got ourselves back down into town. Oh dear - we ended up in Cherries which is just about the best tea room I have ever been in. Proper afternoon tea with a two tier cake stand, eight little finger sandwiches, scone, cream, jam and two large pieces of cake. I resisted and just ordered a sandwich. I did however give a lot of help to Chris with his afternoon tea. One other bit of great news - I have received my first online donation. £2300 still seems a awful lot of money to raise, but as with the training I will work away at it a little bit at a time. This is where I shall report my progess in training for the WSPA Bear Adventure trekking 50 miles at heights in excess of 2,500m through the Carpathian Mountians in Romania. Currently I am old and fat by the time I go I hope to be old and fit! Oh - today I have received confirmation of my place on the trip. If I was scared before I am now terrified! I have seen the list of things I need to take - it includes toilet paper and nappy sacks - I'm really not sure I like the sound of that! 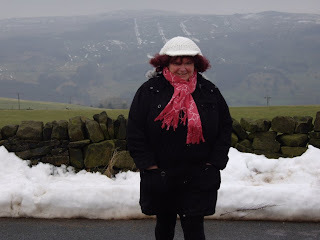 On a positive note now the snow is melting I am looking forward to a good walk in the hills over the weekend. Also today I received my first online donation. Yay - thanks Hilary. The fund-raising is almost as scarey as the trek itself.